The Owls didn’t make a lot of noise in the A-10 Tournament last weekend, finishing in sixth place. The men’s tennis team battled the heat and conference this weekend in Monroeville, Pa., for the Atlantic Ten Conference Championship. The Owls won their opening tournament match against city rival La Salle Friday with a 4-0 victory in which every Cherry and White performer won his match. However, they fell in their next match, 4-3, in a hard-fought matchup against No. 3 seed Saint Louis. The loss ended their A-10 Championship hopes. The Owls still got to compete Saturday and Sunday in the consolation bracket. Saturday, they were once again in a tight match, pulling out a victory against Duquesne, 4-3. Sunday’s encounter with Charlotte was a battle for fifth place, but the Owls lost, 4-3, in another close decision. “I think it just was one of those things that just wasn’t meant to be, but the guys performed well,” coach Steve Mauro said. The stomach muscle injury to freshman Filip Rams was too much for the Owls to overcome, and the team could not recover, despite great efforts from freshmen Dmitry Vizhunov and Mansur Gishkaev. The two Russian internationals did not lose a match during the tournament. Both Mauro and team captain senior Ricardo Velazquez had high praises for the two rookies stepping up their games when it mattered most. “The two freshmen had outstanding weekends,” Mauro said. Rams was named A-10 Rookie of the Week four times this season and was twice selected as the Performer of the Week. He led the team and conference in singles wins with 23. He competed in just three matches this weekend, including a singles loss against junior James McArthur of Saint Louis. Mauro was confident that if Rams was able to continue playing, the team would have fared better. The Owls finished their season 14-10 and sixth in the A-10. The Cherry and White finished the season out with six straight regular season wins and 8-0 in home contests. 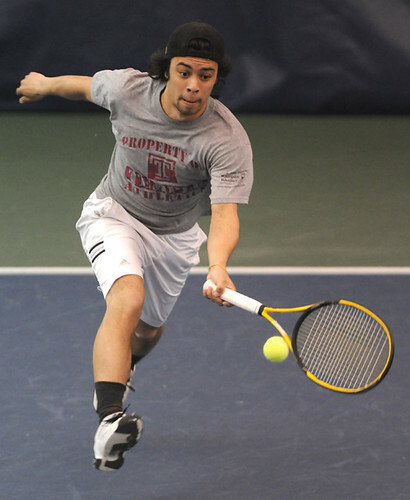 Velazquez, one of three seniors, finished his collegiate career with two singles wins in the tournament but was unhappy by not earning a championship while at Temple. “The seniors are leaving on a bitter note by not winning a championship, our ultimate goal,” he said. Senior Nathan Spunda, a 2007 All-Conference selection, finished the regular season with 17 singles and 14 doubles wins. Senior Eduardo Saavedra finished with 11 singles and 20 doubles wins. The lone junior, Pavlos Stephanides, added 7 singles wins. The three freshmen finished the season with 54 singles wins and added 39 doubles wins in the best freshmen class Mauro has had while at Temple. With Rams, Vizhunov and Gishkaev returning, Mauro should have a good chance to win the A-10 Championship next season and in the years to come. Joe Serpico can be reached at g.serpico@temple.edu. Owls sweep singles and doubles match against Morgan State. Owls continued the season at the Penn Invitational from Sept 28–30. Two Temple faculty members are parting ways with the university after the semester ends.